Premier Rachel Notley announced Sunday the province is going to temporarily throttle back crude production in Alberta beginning next month, and the message for the oilpatch was everyone needs to shoulder the burden. With western Canadian oil suffering massive discounts to benchmark U.S. crude prices due to a lack of pipeline capacity, action was clearly needed. It came — in the form of mandatory production cuts. “We believe markets are the best way to set prices. But when markets aren’t working, when companies are forced to sell our resources for pennies on the dollar, then we have a responsibility to act,” Notley said Sunday in Edmonton. Sharing the pain means the industry will be required to cut back production by 325,000 barrels per day (bpd), or about an 8.7 per cent reduction of Alberta’s total output, beginning in January. In order to melt away a massive glut of crude already stuck in storage — an estimated 35 million barrels — the province will require all producers to curtail output, although it comes with an exemption for the first 10,000 bpd of output for operators. This step is designed to protect junior oil producers who can’t afford such a chop. However, the 25 operators who will be affected by curtailment can decide which barrels they will take off the market, meaning the least-economic production should be shut-in first. So far, industry production cuts have only been done on a voluntarily basis by companies such as Canadian Natural Resources and Cenovus Energy, but this government action will bring other players into the mix. Notley’s strategy is meant to bring oil markets back into balance, as Alberta lacks enough pipeline capacity to move its product to market. There is about 190,000 barrels per day of excess supply, above what can now be transported out of the province by pipeline or rail. The cut will start in January and, if it works as planned and storage levels fall, it will be reduced after the first quarter, likely to around 95,000 bpd until the end of next year. Cenovus’ Foster Creek steam generators. “It is aggressive and obviously meant to have a really immediate impact,” said Kevin Birn, an energy analyst with consultancy IHS Markit. This step is about protecting revenue and jobs. 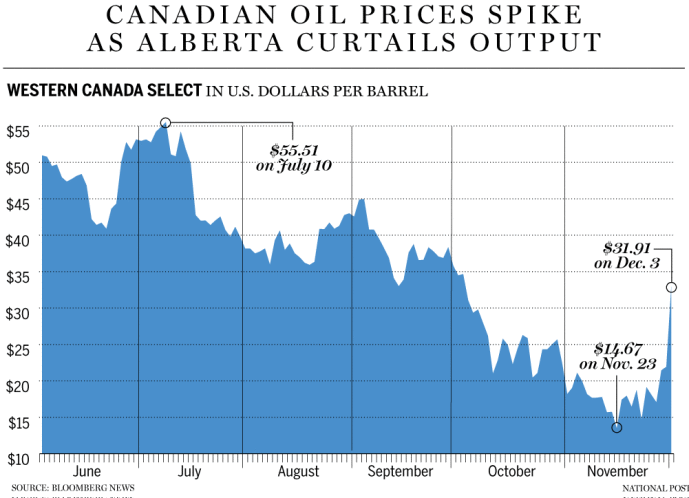 The steep price discount for Western Canadian Select heavy oil versus benchmark U.S. prices has hovered around US$40 a barrel recently, and it’s costing the entire country an estimated $80 million a day. Mandatory curtailment is expected to lower the differential by at least $4 per barrel, but should bump up government revenues by $1.1 billion next year by increasing Canadian oil prices and royalties paid to the province. One point is crystal clear: The announcement is an exclamation point on the intense politicization of energy policy in Canada in the past few years, the likes of which we haven’t seen since the 1980s. Major pipeline projects have been cancelled or delayed as production from the oilsands has ramped up. The failure of Texas-based Kinder Morgan to be able to build its Trans Mountain pipeline expansion project to the Pacific coast — mainly due to entrenched opposition from the B.C. government — led Ottawa to spend $4.5 billion to purchase the oil pipeline, which is now in legal limbo. The steep price discount led Notley to declare last week she will buy 80 locomotives and up to 7,000 rail cars to move more crude out of Alberta by rail. Sunday’s announcement was the pinnacle of government intervention: rationing output. The decision is ultimately about the disappearance of billions of dollars in revenues that the province collects from oil royalties and taxes tied to the sector if the situation continues. It’s also about the loss of jobs, falling investment and a made-in-Canada debacle affecting the country’s energy sector. Some producers have said their 2019 capital budgets could be slashed by up to 80 per cent due to the sudden drop in cash flow levels caused by the price discount. Some layoffs have already begun at oilfield service firms. It’s also exposed a deep rift within the sector, primarily between refiners who benefit from lower feedstock prices and producers who are getting clobbered by the discount. “I am a free-enterprise individual, so it’s never your preferred route, but because of the crisis we are dealing with here, we understand (curtailment) had to be done,” Whitecap Resources CEO Grant Fagerheim said in an interview Sunday. Tristan Goodman, president of the Explorers and Producers Association of Canada, understands why Alberta acted, although he would like the initial exemption level to be set higher than 10,000 barrels per day for operators. “This is a pretty broad brush approach, so rather than localizing it to one area, this is going to affect all Albertans now,” he said. The idea of government-mandated cuts first surfaced after the premier met with energy industry executives Oct. 22, and has gained steam in recent weeks. The province’s plan “will help balance the market in the short term until new rail and pipeline capacity comes on stream next year,” Cenovus Energy CEO Alex Pourbaix said in a statement. However, integrated producers Imperial Oil and Husky Energy weren’t happy with the news of Notley’s required cut. 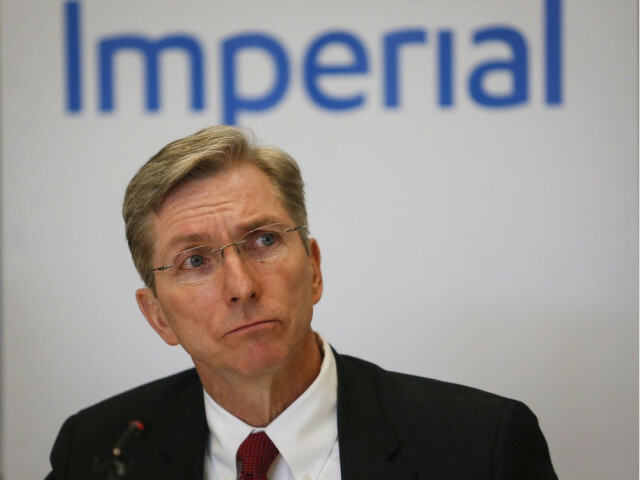 “Free markets work, and intervention carries trade risks and sends a negative message to investors about doing business in Alberta and Canada,” Imperial Oil CEO Rich Kruger said in a statement. In the end, the premier heard both sides out and she acted. Now, the entire industry will share the pain until the bigger issue — building new pipelines in Canada — is finally resolved.